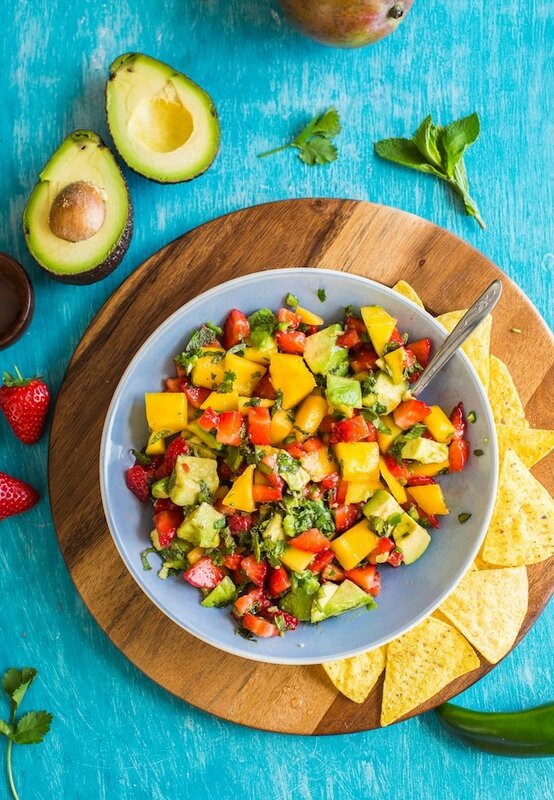 If you’re looking for a summer recipe to confuse your brain and pleasure your taste buds at the same time then step right up: this Spicy Avocado Strawberry Mango Salsa will do the trick! A little sweet, a little spicy but incredibly fresh and takes about 2 seconds to make. Altogether this salsa is easy to make without requiring too many ingredients. It’s really just a matter of adding everything to a bowl and tossing to combine. This is the kind of recipe that’s best eaten and enjoyed the day of so that everything stays at peak freshness, but you can prep everything a day ahead of time – just save the avocado to add last right before it’s time to serve so that it stays nice and green. I recommend serving it over chicken or fish if you want to make a meal out of it. You can also eat it as is with a bowl of chips and a margarita. Had I planned ahead I’d have made some cinnamon sugar tortilla chips to go with it myself. Hover you choose to have it – I hope you enjoy! 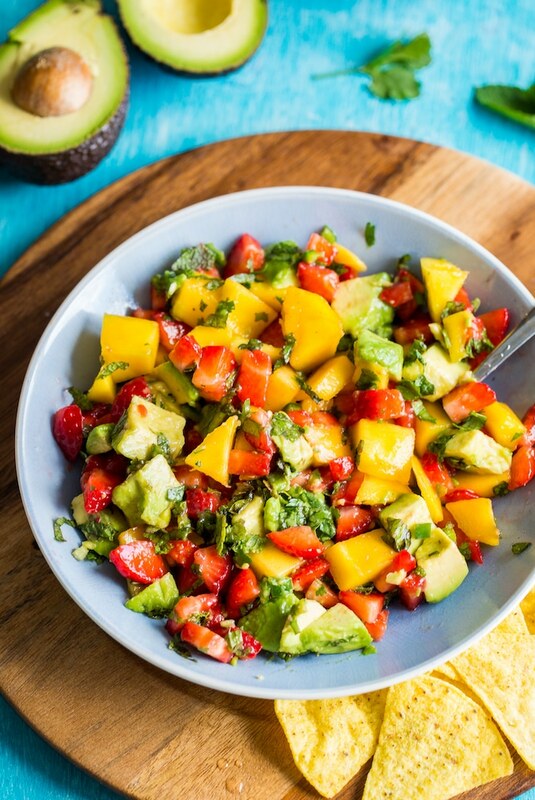 Don’t forget to #asaucykitchen on instagram if you try this Spicy Avocado Strawberry Mango Salsa. I love seeing what you make! You can also post your pictures to my facebook page! 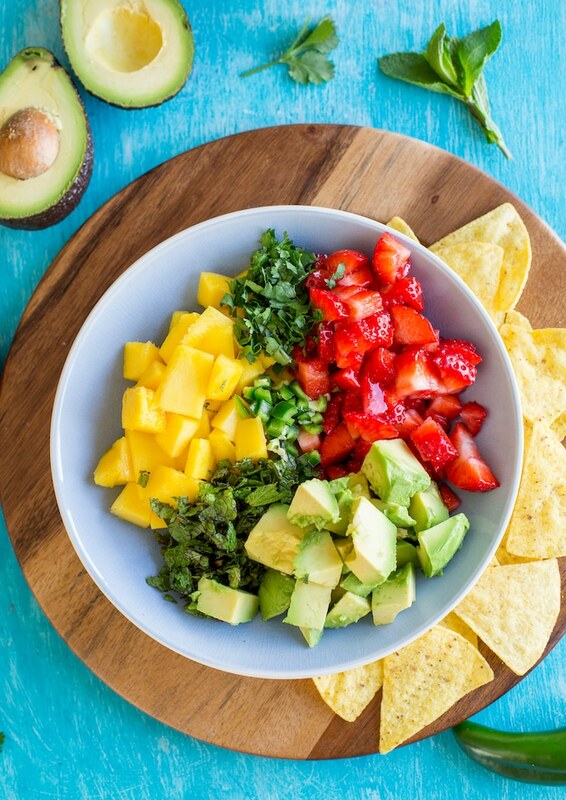 Add everything to a bowl and toss to combine. Serve over chicken, fish, tacos or enjoy as is with chips. If you want to make this to serve at a BBQ or party I recommend mixing everything together except for the avocado and adding that right before serving time so it stays fresh & green.